Hi, friends! 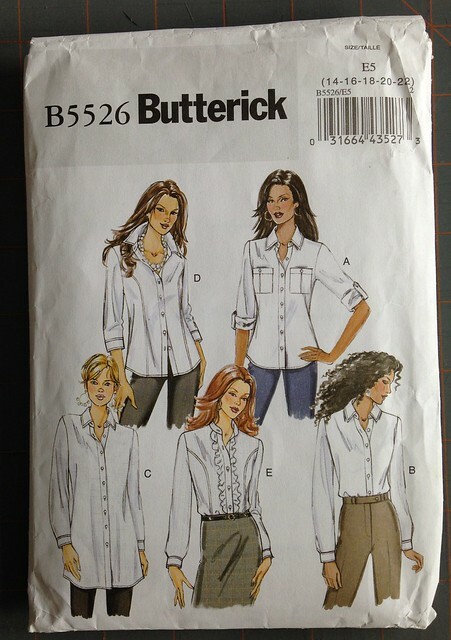 Here we are today with lots of pictures and words on Butterick 5526, which is a women’s button down shirt. 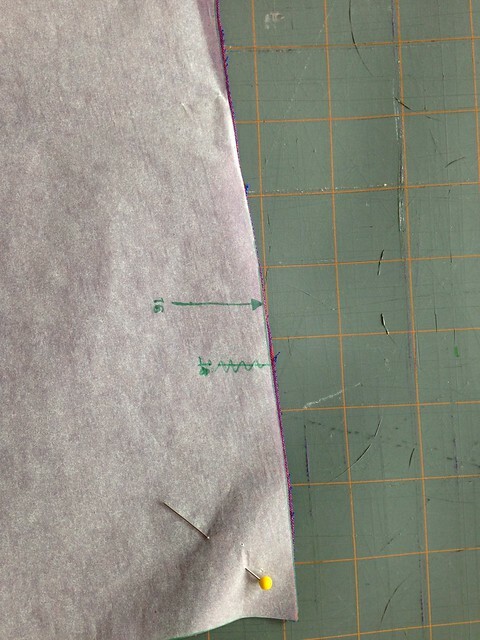 After my last button down, which was a little bit tight through the back/shoulder area, I decided to learn about how to do a broad back adjustment and measure things on the pattern before I cut my fabric. 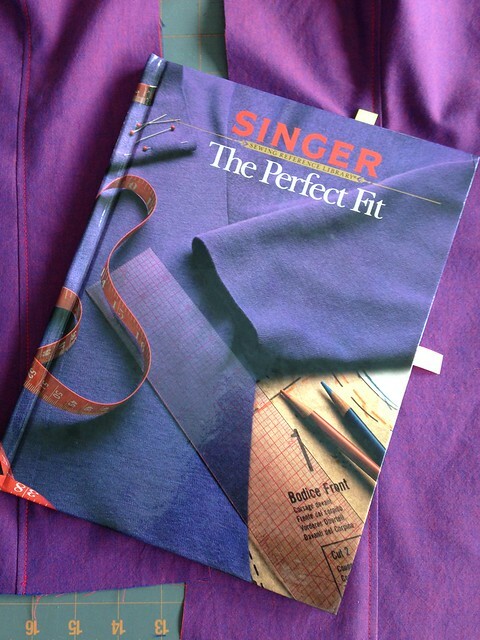 The ever-helpful Maggie from Pintuck & Purl put me on the right track, and I found my final and very detailed answer courtesy of The Perfect Fit volume of the Singer Sewing Reference Library. I cannot recommend these books enough! One of the best parts is that they are often easy to find used at a very low price! Mine were a gift, but I have bought one or two volumes that I didn’t have. Now is the point where things will get technical. If you are just here for the pictures and general stuff, feel free to start scrolling at this point. I’ll let you know when it’s over. The book instructed me to have someone measure my back between the creases of my arms. I measured about 6″-7″ down from the prominent bone at the base of my neck. The instructions said to measure 4″-6″ down, but I went a little lower so I could measure at the top of my arm creases. 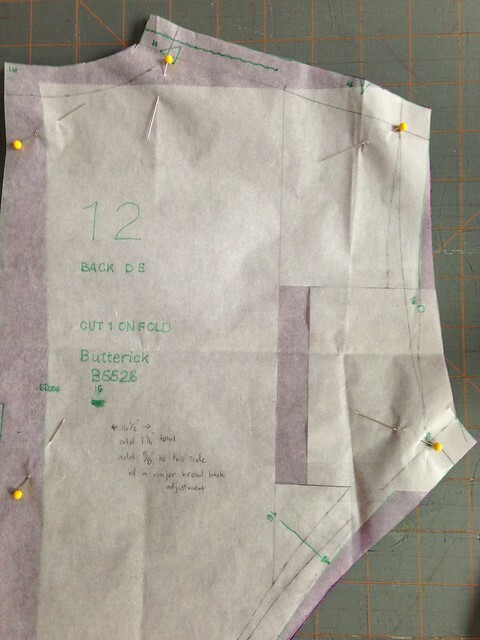 My back width was 16 3/4″, and the book advised a minimum ease of 1/2″-1″ for a blouse, meaning my garment should measure 17 1/4″-17 3/4″ across the back. 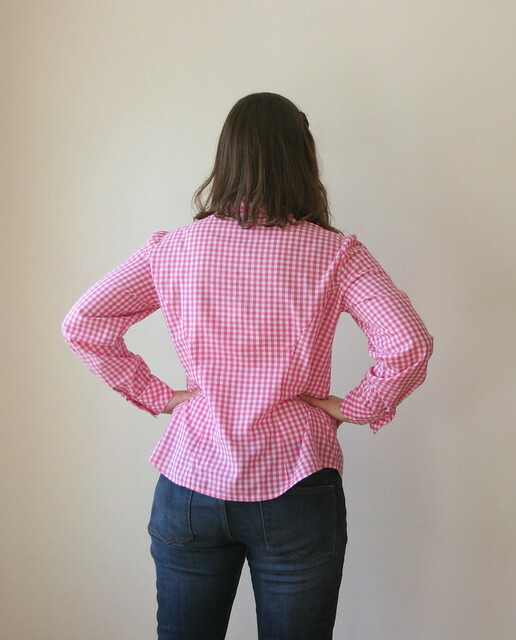 The back width of the pattern was 16 1/2″, so I needed to add 1 1/4″ total or 5/8″ to the pattern piece (since the pattern piece was only half of the back of the shirt). 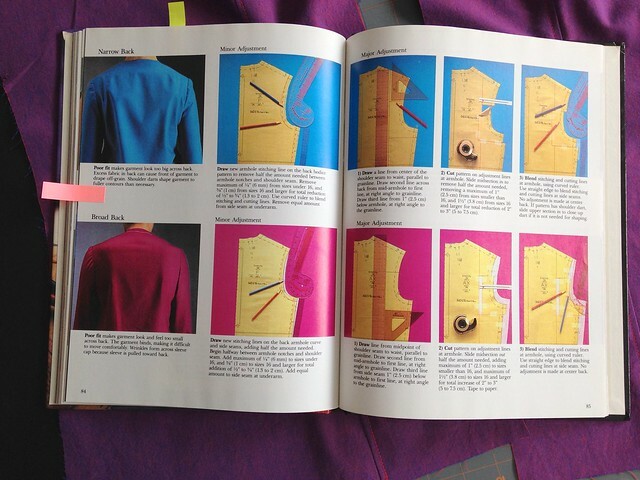 The book gives you instructions for making a minor adjustment and a major adjustment. Because of the amount I needed to add, I used a major adjustment. The minor adjustment was appropriate for a total addition of 1/2″ for sizes under 16 and 3/4″ for 16 and larger. 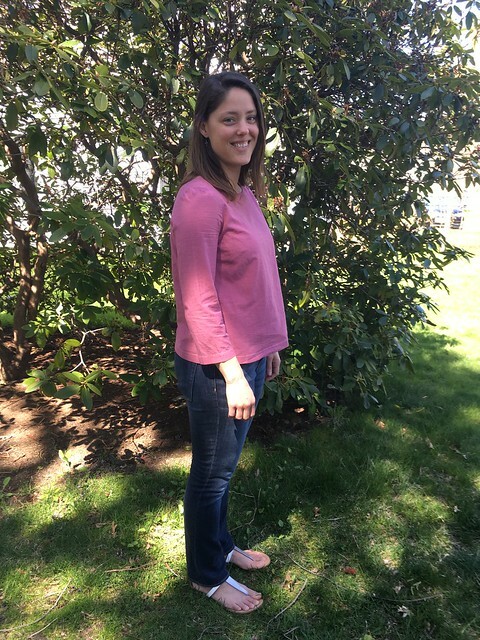 The major adjustment is good for 2″ total in sizes under 16 and 3″ total in sizes 16 and up. By ‘total’ I mean the amount across a full size back pattern piece. 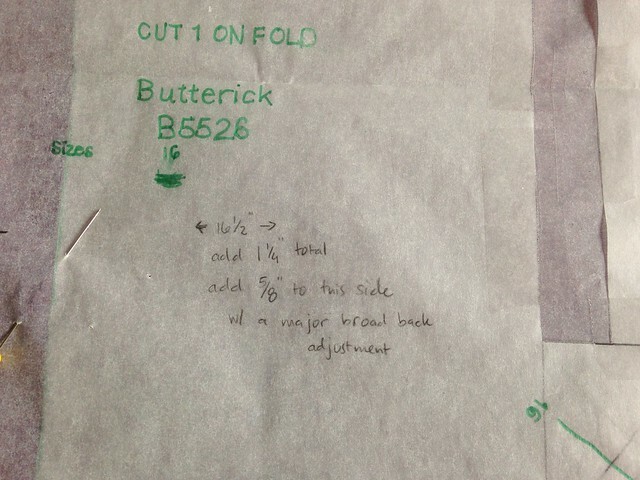 If you are adding to a pattern piece representing half of the back, as I was, you would cut those ‘total’ amounts in half. I chose the major adjustment because the amount I needed was more than the amount listed under the minor adjustment instructions. 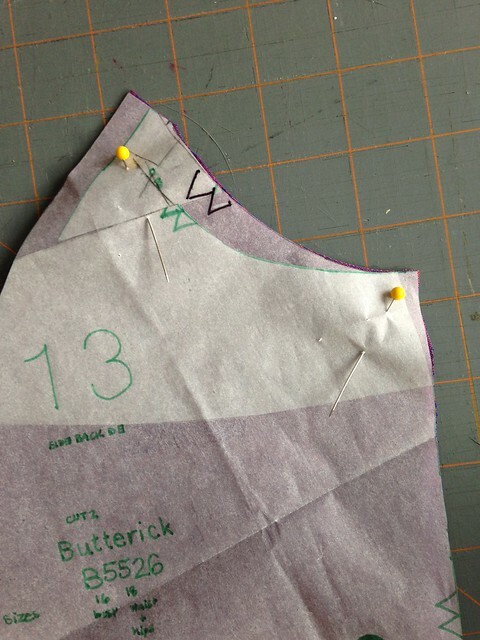 One puzzling part that I ran into is that the example shows a pattern piece without princess seams. My pattern has princess seams. I was a little worried since this was my first time making this adjustment. What I ended up doing was taping the pattern pieces for the back and the side back together where they would be sewn together at the underarm and doing the adjustment across both pieces. Then, I just crossed my fingers and hoped for the best. The good thing was that, although I love the fabric I chose, it was also very inexpensive (it may have been around $3-$5 a yard), so if I really messed up, I wasn’t out too much money. The above picture probably isn’t the most helpful because I set the pieces together after the fact. I should have taken in-progress pictures, but I didn’t think of it. Below are the individual back and side back pieces after the adjustment. After making the adjustment to the pattern, I cut everything out, and sewed it all up. This wasn’t a difficult pattern, but I was really happy that I had my last shirt under my belt. It helped me to have an idea of how long things were going to take. Shirts have a lot of little steps, but they are really satisfying to make. I followed the directions as written, with the exception of going back and zigzagging my seam allowances that hadn’t been topstitched down. At some point I may use a more polished finish. In my initial tracing of the pattern, going by my measurements, I made a 16 in the bust and graded out to an 18 for the waist and hips. I found this to be very comfortable, and I wore it to the wedding I mentioned in the last post, but I sort of felt like there were little “wings” at the sides. So, after getting home, I basted the side seams to be a little smaller, guessing how the shirt might have fit had I cut a straight size 16. I was worried that it would be tight across the middle, but it’s not at all. It still has plenty of ease, but it removes the “wing” effect. 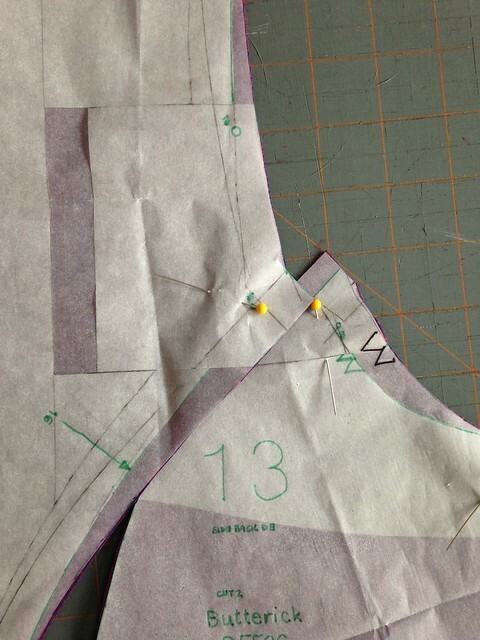 For my next shirt, I retraced the waist and hip part of the pattern and cut it down to a 16. For others interested in making this pattern, I would say that this still has a fair amount of ease. 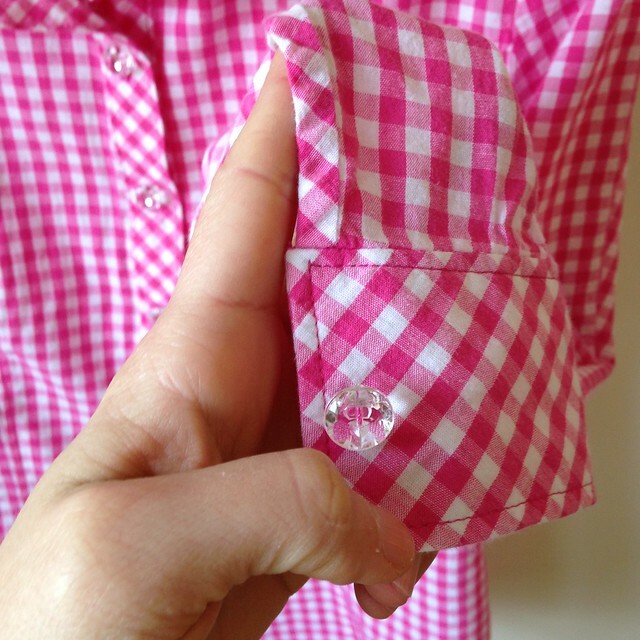 If you like your shirts to fit more closely, you may want to measure the pattern pieces and decide if you want to size down further. I also cut the cuffs, collar, collar stand, and plackets on the bias. I was hoping it would work out ok since I was going to interface those parts with a fusible interfacing, and it worked out great. You can see that a little bit in the picture below. I really like the effect. I found out about this pattern by reading Lauren’s blog, Lladybird. She has the power to make me want to try out just about any pattern, and she wasn’t wrong on this one. I’ve got another one in progress with more of the fabric I bought last summer, and I’m contemplating future versions in basic white and black. This pattern is a winner. Now I just have to go back and try the broad back adjustment on Simplicity 1538. I think that one needs a larger adjustment, though, so I put it on the back burner while I work on a few other projects. One last thing before I go…I love getting recommendations, sewing and otherwise, from other bloggers. If you’ve ever listened to the While She Naps podcast, you’ll notice Abby and her guests sharing recommendations at the end of the show. I love that. So, when I have something fun that I am really enjoying, sewing or otherwise, I’m going to put it at the end of the post in case you want to try it, too. This isn’t advertising. No one is paying me to write this blog. It’s just stuff that is fun for me right now or a really great reference that I like. That’s why I’m going to call it: This is fun now…at least until I think of a better title. Feel free to suggest titles–I’m listening. This is fun now: Today’s recommendation (other than the Singer Sewing Reference Library) is an etsy jewelry shop called Adam Rabbit. I’ve been a fan for a few years now and my family has been nice enough to get me some of the jewelry in the shop the last few Christmases. If you like chunky, rough gemstones and a style you might find in Free People or Urban Outfitters, you may enjoy this one. The owner occasionally has deals for Instagram followers, too. Enjoy! 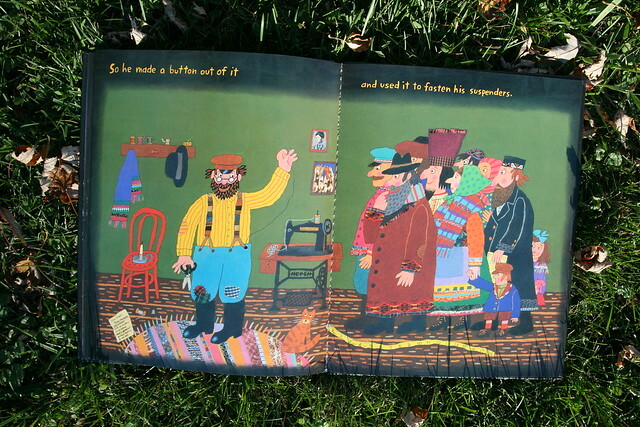 I don’t make much menswear (yet), but when I saw the exciting announcement that Thread Theory was opening an online supply shop for menswear and general sewing materials (which is now live), I got to thinking about children’s books with sewing in them. 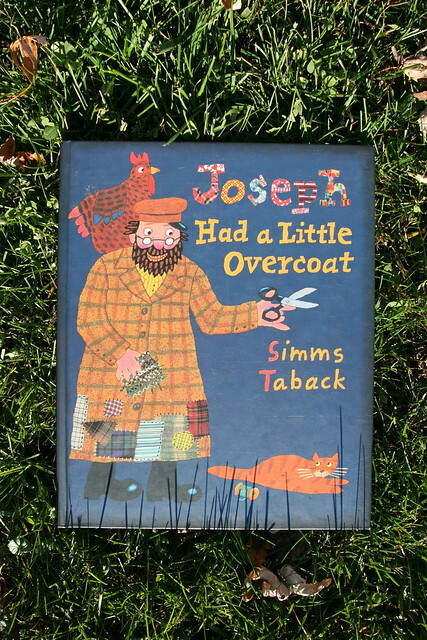 Morgan (the owner) said that she was stocking one such book, and I suggested one of my own favorites: Joseph Had a Little Overcoat by Simms Taback. In our house, we have a lot of children’s books…but they don’t all belong to my children. Most of them do, but a few are mine and can only be used with permission. 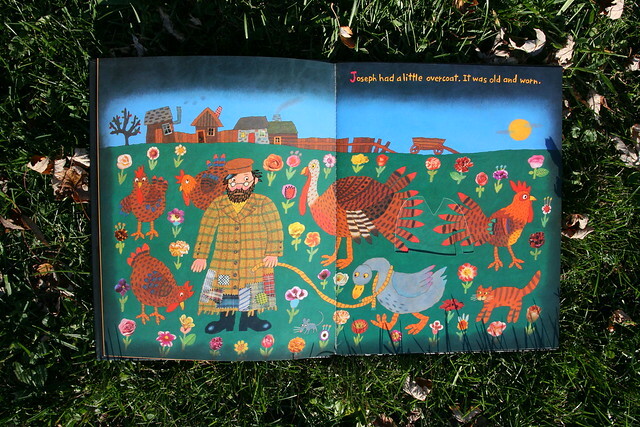 These are books with illustrations and/or stories that I love for various reasons. 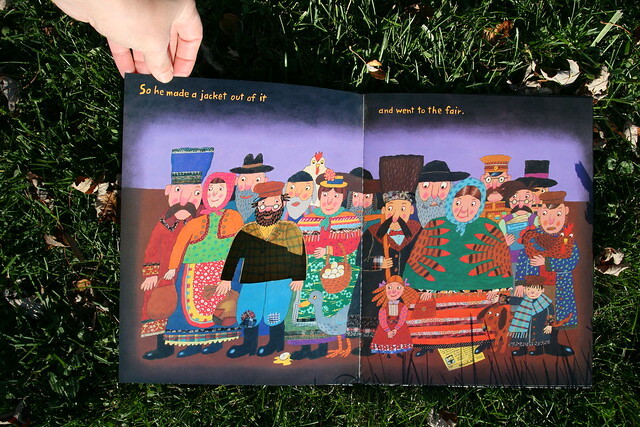 When I discovered this book, I was entranced by the super cool cutouts that led from one page to another (and also appear on the dust jacket, which I didn’t photograph). I didn’t really sew at the time that I got it, but I made a lot of things, and I love clever and surprising art. As I thought through my books, I realized something that is BEYOND OBVIOUS to me now that I have noticed it. This is the PERFECT book for anyone who sews and anyone who refashions or makes do (or wants to secretly indoctrinate their children in the ways of sewing and making do–you know who you are!). 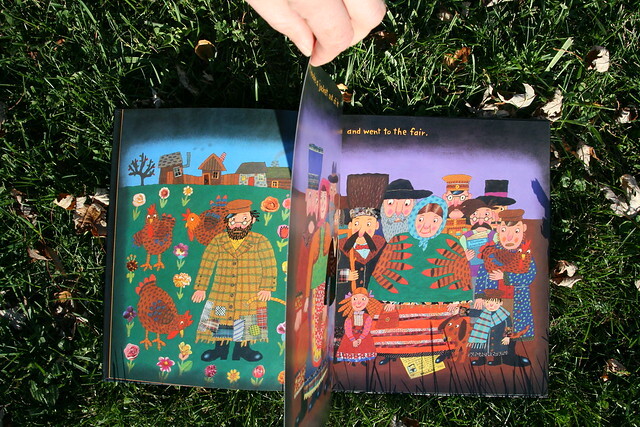 SPOILER ALERT–don’t read on unless you are ok with knowing how this book ends!!! He loses the last little bit of it. What will he do now? Write a book about it! 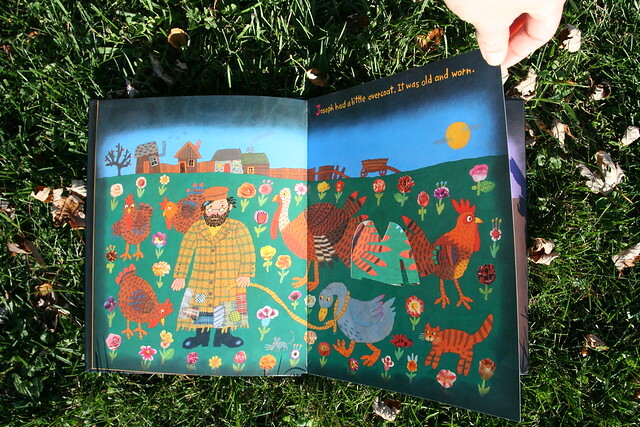 This is such a creative, inventive story, both on the level of the character in the story and on that of the author and illustrator himself. The copy I have is a second take on his original version (which I haven’t seen), and it’s just brilliant. I don’t know the author. I don’t get a kickback from telling you about this. 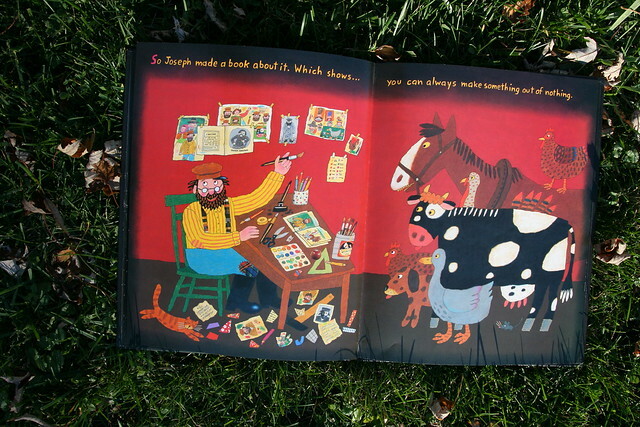 I just think this is the best book for those who love handmade, and I think the kids in your life will love it as well. There is even a song about the story printed in the back for extra fun. Check it out from your library and see what you think! Happy Independence Day to all my American readers! British readers, I’m glad we’re friends again. July 4th (American Independence Day) is one of my favorite holidays to spend with my extended family. This almost never happens any more, and so I usually find myself missing my parents as I plan out whatever red, white, and blue outfit I can come up with for the day. My Mom, especially, always got into July 4th, telling us we had to wear red, white, and blue. 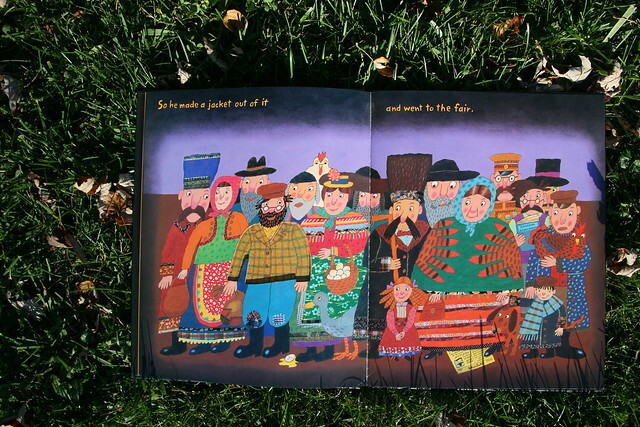 And if my Aunt Jane was with us…well, it usually got out of control! Picture temporary tattoos with flags or glitter or both, all kinds of sparkly nail polish, and really whatever weird or embarrassing thing they could come up with. I would roll my eyes and say how ridiculous it all was, but now that I rarely get to be with them on Independence Day, I miss all the craziness. And I still find myself looking for a red, white, and blue outfit come July 4. For the past few years, I’ve wanted to make my own version of this Alabama Chanin corset tank, so I finally decided now was the time to do it. My friend Mary (also mentioned in this post) gave me some unused white t-shirts, and I cut them up according to the pattern in Alabama Stitch Book by Natalie Chanin, and sewed them back together to make my own tank. I’ve made this pattern before and liked it. 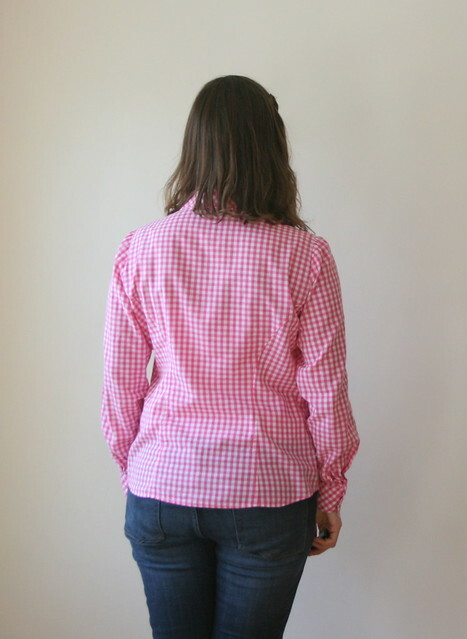 Rather than hand-sewing the shirt, I chose to use my machine for speed, and instead of beading my tank like they did in my inspiration picture, I used a double strand of red button/craft thread to hand-sew my seam allowances down in a way that I liked. I also chose to bind the bottom edge. Before making this, I tried to raise the neckline using the instructions in Alabama Studio Sewing Patterns (also by Natalie Chanin), but I took a wrong turn somewhere and ended up with things just as they had always had been. The low cut is definitely flattering, but it’s a bit too low for my comfort level, so I had to enlist an undershirt for a little extra coverage. I’ll try to raise the neckline again another time. While sewing this, I was watching a movie with a baseball theme, and pretty soon, all I could see was a baseball-inspired shirt. I guess I could wear it to a game or for the 4th of July! I kept my knots on the inside, although the shirt is reversible, so I can also flip it inside out, if I want something a little different. All I needed was some blue jeans and I’m ready for the 4th of July! P.S.–I may take a little time off this month. I’m not sure what that will look like or how often I will or won’t post, but if it seems quiet over here this month, don’t fret. I’ll get back up to speed in August. Welcome to Week Four of Me-Made-May ’15! This was another good week with fewer repeats than I had expected. Let’s get straight to the pictures! Friday’s theme was “animals”. I dug out this t-shirt that I self-drafted (with the help of Design-It-Yourself Clothes by Cal Patch). I had planned to make some changes to it, but after putting it on, I decided it still worked. Another point for immediate gratification! You’ve seen this one before! 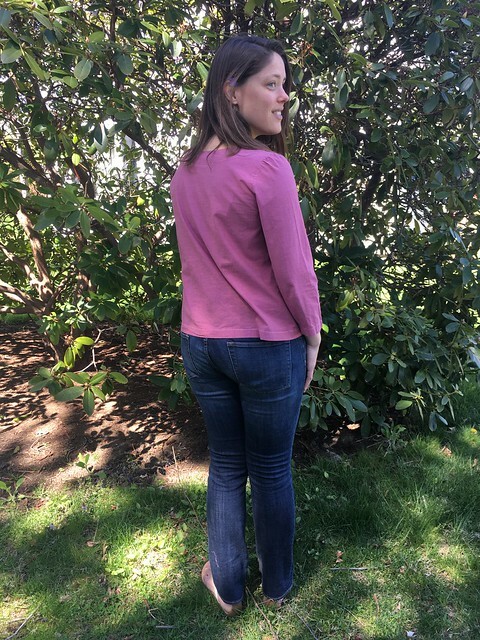 This was another wear of my pink Summer Blouse (but this time with new boots–major thrifting score!!). Note the lovely clip-on earrings scored at Brimfield. Now for one that long-time readers will recognize. This dress was in my first post for this blog. It was a pairing of Alabama Chanin reverse applique and beading with a pattern from The Party Dress Book by Mary Adams. It was beyond my skill level at the time, but it was so worth it, imperfections and all. My photographer (my daughter) told me we absolutely HAD to have a twirling shot. This circle skirt is pretty awesome. Next is this Alabama Chanin corset from Alabama Stitch Book by Natalie Chanin. This is such a great tank. It has fit me at various sizes and has such interesting lines. It’s also reversible! I usually wear it like you see it above because I like to see the seam allowances, but you can also wear it as below for a more subtle effect. You will probably not be surprised to see yet another Alabama Chanin make. These are a summer staple for me. 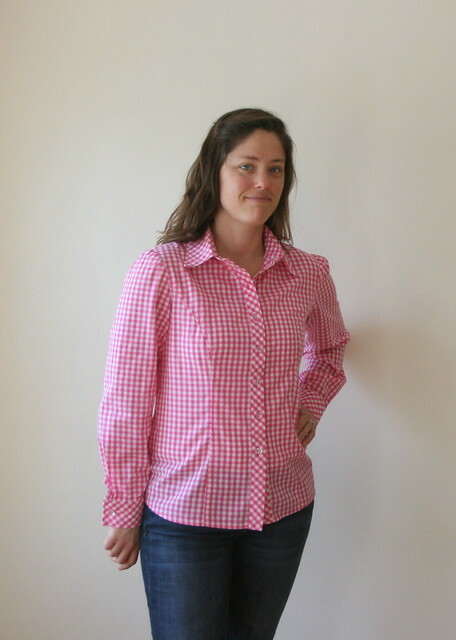 This is the Fitted Top from Alabama Studio Sewing + Design by Natalie Chanin. Try not to be shocked. This one’s from Alabama Chanin, too. This is the Long Fitted Dress from Alabama Studio Sewing + Design. Maybe you can tell that the top in the above picture is really just the top part of this dress. You might also recognize the fabric from Day 21. I got a lot of mileage out of this sheet and the t-shirt I cut up for neck and armhole binding. I like to wear this one with the seam allowances showing, too, but you could easily turn them to the inside. Most of these makes are from pre-blogging days, so it’s fun to get them out. Next week’s Me-Made-May post will cover the last three days of May. Three more to go! I can’t believe it. See you then, if not before! Happy May! It’s finally May and even though it’s not really warm here, it’s not winter, either. The leaves and flowers are budding and starting to show their colors. This is the time of year I’m reminded that you can actually crave color. I just want to squeeze all the gorgeous greens, blues, yellows, and pinks that are starting to come out! The other thing I’ve realized is that I want to dress in all these colors, but…it’s still cold, which means layers and long sleeves. 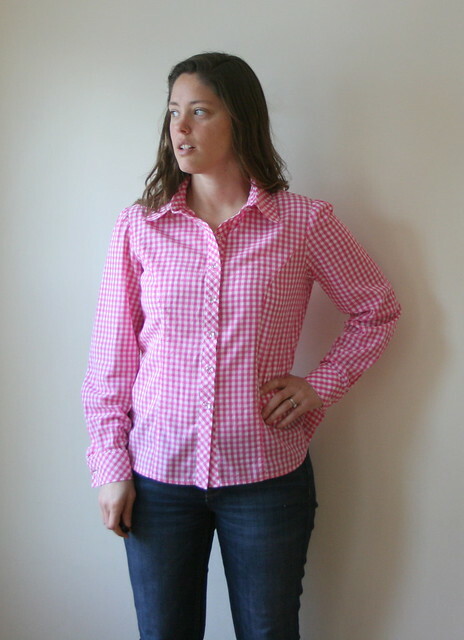 Must mean it’s a good time to make up another Summer Blouse from Weekend Sewing by Heather Ross! I’ve made this blouse twice now. This is a garment that gets a lot of wear in spring and summer, and maybe a little bit into fall. My fabric of choice is vintage sheeting (as in, “Go to the thrift store and buy a sheet with a pattern you like.” Cheap and easy. Just don’t forget to prewash!!!). 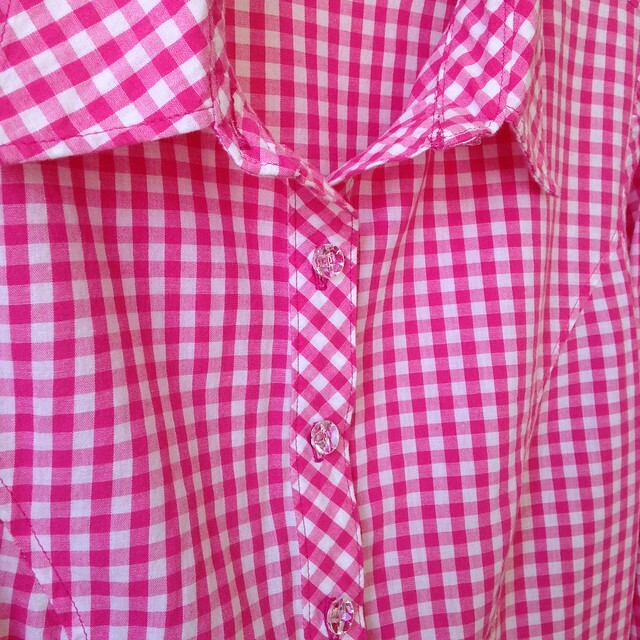 I love this fabric for this shirt because all day long you feel like you are getting into newly cleaned sheets. They don’t wrinkle much and are ideal over a tank top if you need a little break from the sun or if a breeze comes up. If you need to take a nap, it’s like you are already in bed (ok, just kidding about that one…unless you wear a blanket-like wrap over top!). My favorite place to wear one of these blouses is The Brimfield Antique Show, but really any antique flea market will do. Not only do you get the sun and wind-repelling benefits I mentioned, but if you use a vintage sheet, you look like you’re dressing for your surroundings. 😉 Just be warned that you may have people look at you funny and then, when they find out you made your shirt from a sheet, tell you their grandmother had those same sheets. A nice thing about this pattern is that you can make this at nearly any skill level. 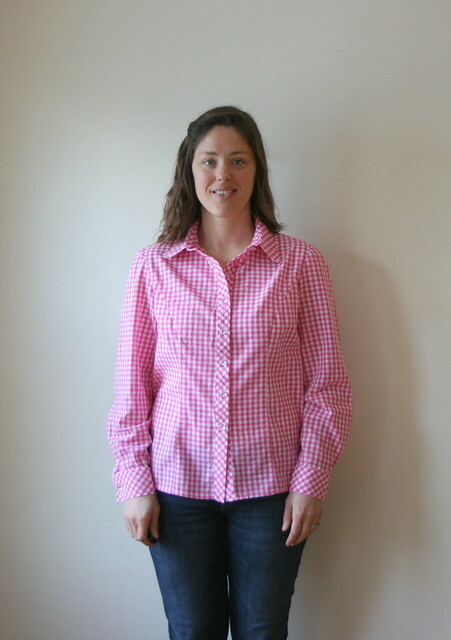 I made my first version of this blouse when I was pretty new to sewing, and I still love and wear it. 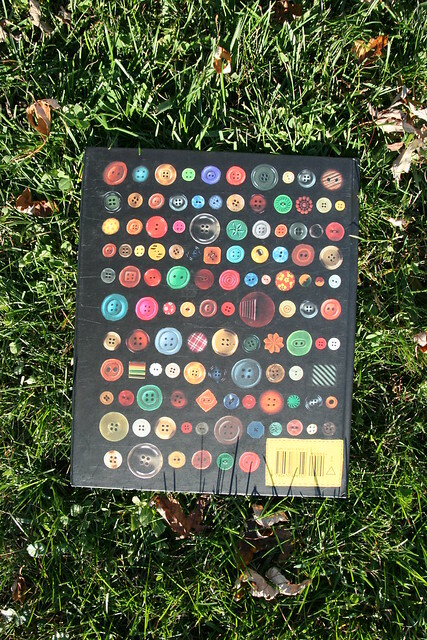 This can also be a great pattern to use a vintage button on if you have a stash of them. A few things to note: my version didn’t turn out quite like that pictured in the book. If I actually try to button this, it sort of chokes me, so I always keep it open and wear it over a tank top. 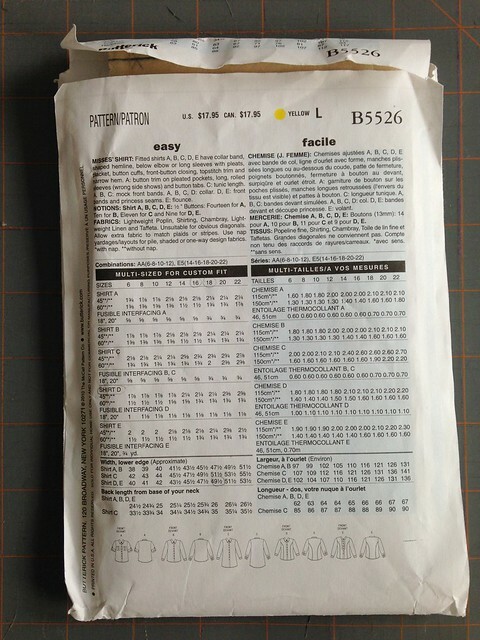 There is an omission on the pattern pieces (it’s missing some markings at the shoulders). You can find all errata here. It’s also much shorter on me than the one on the model in the book. 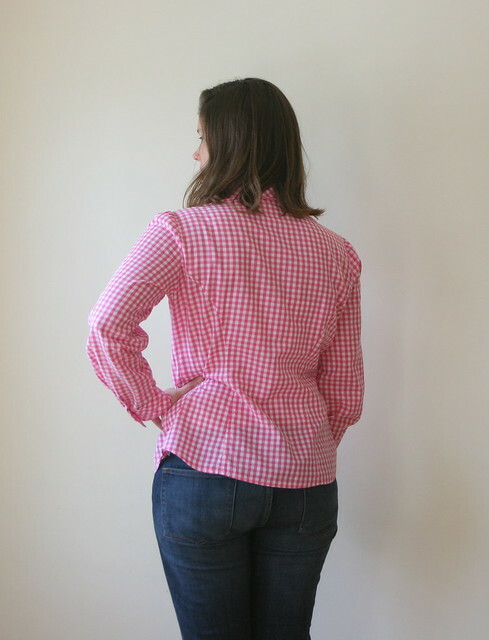 Even with these differences, though, I love this blouse, and I’d recommend it as a nice summer top to make from sheets, voile, or any light fabric. Layer it with a jacket for cooler days, and you are all set for antiquing or any fun outing. I think it’s time for a little catch-up around here. I took a break from sewing bathing suits after making my tests runs to try a few pattern alterations and to begin exploring exercise clothing. 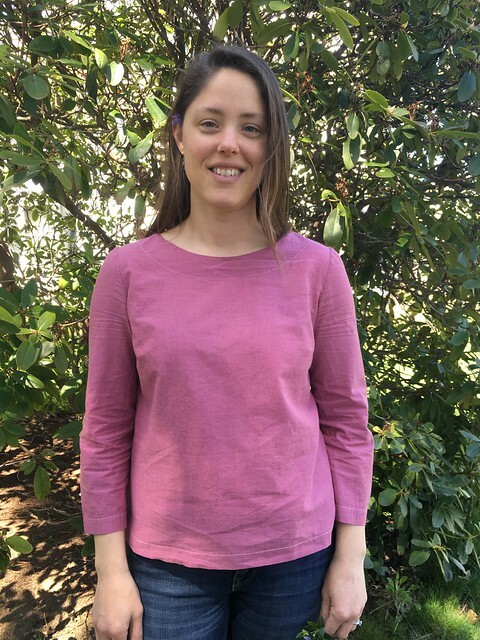 My goals were to give my basic Alabama Chanin long-sleeved t-shirt pattern tapered sleeves and a boat neck, to turn a New Look dress pattern into a t-shirt with a curved hem, to make an exercise shirt, and to make some exercise leggings. 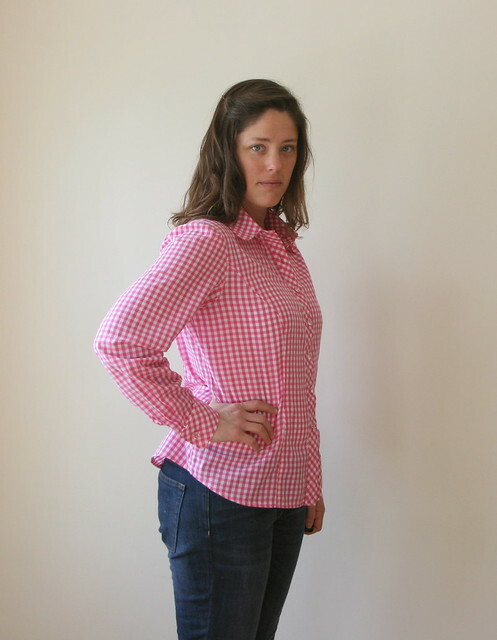 During the winter I had wanted a long-sleeved boat (bateau) neck shirt pattern. I had some fabric in mind for it and I thought it would be a useful addition to my pattern library since it’s a style that is versatile enough to work in casual and more dressed up settings. 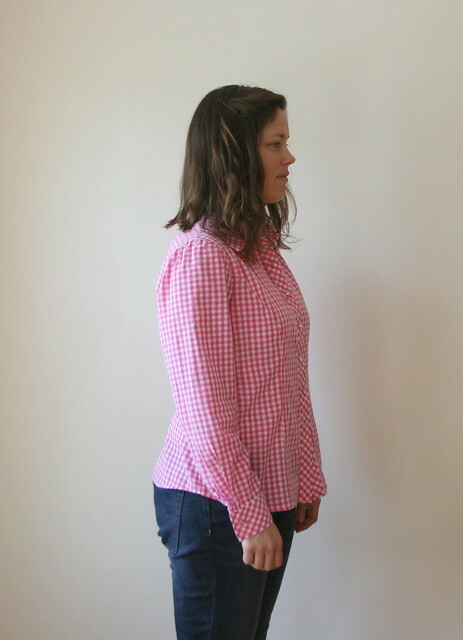 I took the basic t-shirt pattern with long, fluted sleeves from the book Alabama Studio Sewing + Design and, using the directions in Gertie’s New Book for Better Sewing, tried to create a boat neck that would not be so wide as to show undergarments, but would still have that classic look. I also decided to taper the sleeves so they would no longer flare out at the bottom. I think the sleeve alteration went well, but the neckline needs to come together in a point at the sides rather than being a flattened oval. Here is my test garment, made from knit sheets and sewn with yellow thread for contrast. I’d call this a partial win because even though it doesn’t fit my entire vision, the sleeves are good, and my wardrobe desperately needed some brightly colored t-shirts for spring. I can always come back and work on the neckline later. Next is my alteration of New Look 0595 from dress to t-shirt. I love raglan sleeve t-shirts and have been looking for just the right pattern, so I decided to experiment with altering this one. Version one turned out shorter than I had planned and anticipated, so I added a few inches and came up with version two. You can’t see it very well in these shots, but the skirts had some seaming on them that adds to the interest of these shirts and also makes me look like I did more work than I actually did. Nice! Next up is my first try at an exercise shirt. 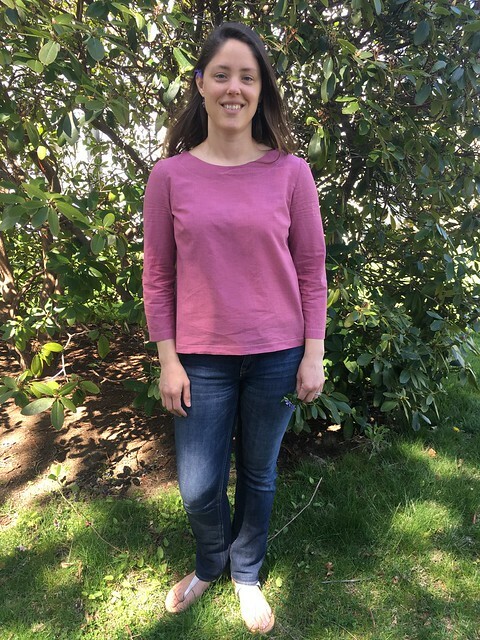 I was intrigued by PatternReview’s Activewear Contest (although I didn’t enter) and I love looking through the clothing and patterns on Melissa Fehr’s website, FehrTrade. So, thanks to some wicking fabric and poly/spandex from Joann Fabrics and McCall’s 6848, I ventured forth. This McCall’s pattern is one you may remember from when I made these shorts in a wax resist/Ankara fabric. The pattern is actually for pajamas, but the shirt was perfect for the gym. This was really fast and easy to sew. 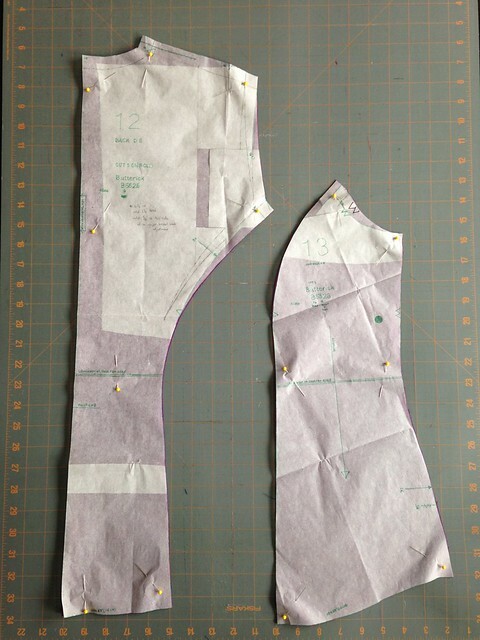 Even though this pattern is for wovens rather than knits, I went with my measurements and made a medium. I like workout tops that are a little loose for airflow. This one feels great. For the edges, I hemmed the bottom by folding the fabric up and sewing with a zig-zag stitch, and for the arm and neck edges, I cut strips of my back fabric cross-grain, folded them over the raw edges, and zig-zagged them on. Since the knit fabric won’t fray, you don’t have to fold the edges of the binding under or double fold it at the hem (or finish any edges on the inside). I love knits! When I went to they gym to test it out, I felt like the coolest person there. I would definitely make this one again (and probably will). Not too bad. Maybe the fabric is a little thin, but it was a start. I took them to the gym to test them out just by shooting some baskets–nothing too strenuous. Oops. The waistband’s a little loose. OK. I could fix that. I folded it over for the time being, and kept shooting baskets. It was winter. I was cranky. I needed some form of exercise. Then, I had this problem. Can you see what it is? Pull up the other side. 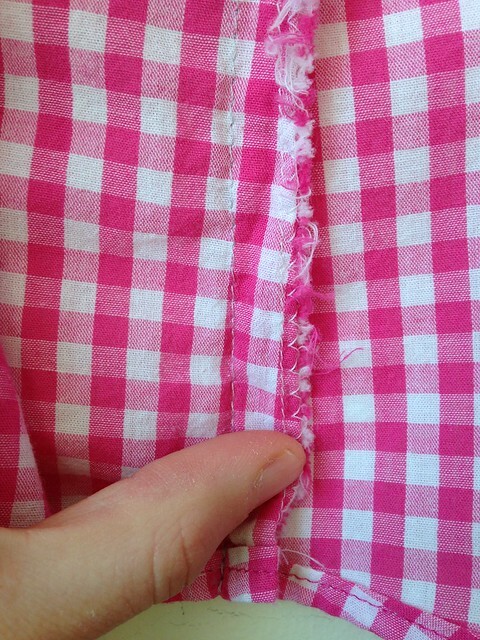 Make sure the front is pulled up and fold that waistband over again. Hm. Maybe this was more than an elastic problem. Luckily, no one is really looking at you as much as you think they are, so it wasn’t like I was a spectacle or anything. However, I started to think that maybe this problem had something to do with my inexperience and, um, my fabric choice. I went back to Joann’s and looked. This fabric only has about 8% spandex and definitely stretches more in one direction than the other. So, these leggings got chalked up to “a learning experience” and they are going back with the other fabric to be reused in another garment. I also bought myself the FehrTrade PB Jam Leggings Pattern to one day try exercise pants again. Exercise Leggings: a miss and a craft fail (but a good learning experience). I’m hoping to finish one last project and then get back to bathing suits (and more!). I really, really want to try adding underwires to the Soma Swimsuit while simultaneously turning Bikini Variation 2 into a tankini. Even after plenty of online research, I’m not confident I know what to do as far as adding the support I want. Any advice? I think I’ve been avoiding it. It could bomb or it could BE the bomb! Stay tuned!!! I’ve got a fun book to share today. Hunt, Gather, Cook: Finding the Forgotten Feast by Hank Shaw has made it to my house from the library twice, if not more. The very best how-to books, in my opinion, give you the feeling, “It’s possible!”, whatever the “it” is that you are learning about. This cookbook/foraging guide by Hank Shaw is exactly that kind of book. I also love a good back story for recipes, and this book often gives you not a brief description, but a true (and interesting) back story. As you might expect, he talks about foraging for certain plants, but he also gives you pointers on how to get started if you want to clam, fish, or hunt, and then what to do with all that you collect. While Shaw grew up on the East Coast, he’s lived throughout the USA and now lives on the West Coast, so his experience with wild food covers a broad range of places and environments. Check out his blog, Honest Food, and you can keep up with him and his adventures. Here are some images from Hunt, Gather, Cook. Thanks to Hank, I tried my first rose hips this year, since the very roses that he mentions in the image above grow all over our beach here. The first try was bland, but the second was better. Now I’ll have to try more! If you have a food-lover in your life, you may want to encourage them to check out this book. It’s a very interesting read, and I can’t recommend it highly enough. Now for some more fun things to check out! For more foraging information, try out my two current favorite pure foraging books. (These are not cookbooks, but they do give you some guidance in that area. ): The Forager’s Harvest and Nature’s Garden both by Samuel Thayer. This guy is smart, experienced, but also adequately cautious when it comes to wild food. What if you love food, but hate the wild (or would rather grow your food instead of search for it)? Try The Edible Flower Garden by Rosalind Creasy. This is such a fun book for garden planning. Most years I use it to try out one or two new edible flowers, just to keep things interesting. You know how some people have “twins” that they aren’t really related to? In college there was a girl that people always confused me with. She was actually awesome at sports I did not or no longer played, so it was nice to get compliments meant for her, even though I had to disillusion people afterward and tell them I hadn’t played basketball since high school. (Also, I was a bench warmer. I made two points my freshman year of high school. It was my 15 minutes of fame.) While the two of us resembled one another, it was NOTHING like the resemblance between actor/comedian Will Ferrell and drummer Chad Smith. I think these guys were separated at birth. Want to see it? Here is their “drumoff” on “The Tonight Show with Jimmy Fallon”. If you choose to watch this clip, though, you should probably watch Will Ferrell’s famous cowbell sketch first, just to be fully prepared. I thought it would be nice to take a little break from clamming and show you what I’m working on. Once, I asked my husband to make me only work on one project at a time. He is a wise man, and did not attempt to do this. Seems like having multiple projects happening all at once is the way my creativity works best. At least that way, if I’m procrastinating on one project, I can move ahead with another. As I mentioned previously, I’m working on sewing something I said I would never sew: a bathing suit. This is one of the projects I am procrastinating on. Here’s what I’ve got so far. In case you are interested, here is the pattern that I’m using. So far, it’s going ok, thanks to numerous blog posts around the web, but I keep avoiding it because I’m afraid I’ll mess it up. That’s pretty silly, though. I mean, really. If I could master bathing suits, I would probably be tapping into one of the few areas of home sewing that’s actually still cost-effective. It would be SO GREAT…so I’ve got to get moving. You can all hold me accountable to actually finish it. Plus, I need a bathing suit that fits. 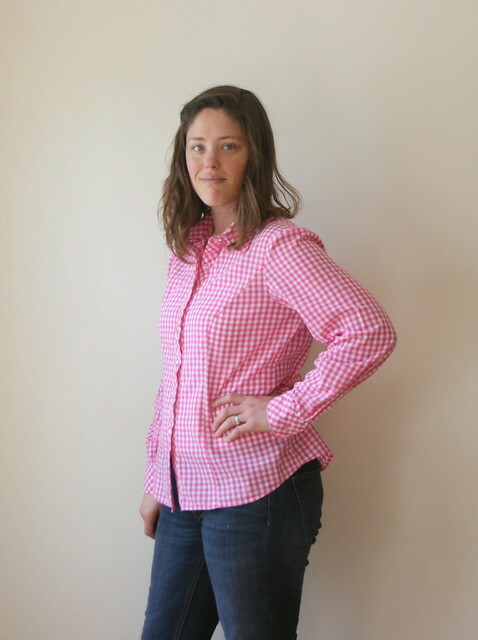 One of the projects I am using to procrastinate on my bathing suit is this shirt, made with a pattern from Alabama Studio Sewing + Design by Natalie Chanin (one of my all-time favorite sewing books). This is the sleeveless t-shirt top. I decided it needed some details, so I added the contrast binding and then tried to add some crochet trim. Above is the marking I made for the trim, but the trim was too white, so I dyed it in black tea. Not to fear, though! I decided to procrastinate on the t-shirt with this! I was trying to actually make a decision, but it was tricky. I tried the dress on to see how it looked and realized that the fabric is pretty thin and, rather than skimming curves, it reveals the curves and lines that you usually want fabric to skim over. So now I’m procrastinating on this project, too. I also made a little sign with paint pens on some bits of slate to mark our morning glories and moon flowers. I’m hoping they take over the deck rails. Lastly, check out my leeks. They flower every year and look so cool. They also attract all kinds of very waspy looking insects, so I admire them from afar or in the evening, just to be safe. Two summers ago, I got my first recreational clamming license. I really wanted to learn to forage, but I was nervous about teaching myself. I also felt like I needed a little guidance if I wanted to learn to fish, but I thought I might be able to learn to clam. Why clamming? Well, this part of New England is pretty big on clams, so it seemed like a good way to learn more about the place I now call home, and I thought it would be fun. Why not? The only problem was, I didn’t actually know any clammers, despite the fact that it’s a big industry around here. (We even have a Shellfish Constable. Isn’t that the coolest?) So, I turned to books and the internet. Just in case you share the same interest (You were probably hoping I would post on this, right? ), I thought I would point you toward the resources I used to get started. First up: The Compleat Clammer by Christopher R. Reaske. This was a great book for learning about the different tools I would need both for clamming and in the kitchen. It was also really interesting. Next up: Clams: How to Find, Catch and Cook Them by Curtis J. Badger. While The Compleat Clammer is written by a New Englander, Clams is written by a Virginian. It was great to get a bit of a look at clamming in another part of the country. While much of the information in the two books overlaps, every region has slight differences, so I say, read widely and learn as much as you can! Clams gives good strategies for those with and without a boat as well as interesting history and lots of good recipes. I also spent time on Google and YouTube looking for clamming and cooking videos. One of the most helpful, was this one on “How to Open Clams” by Rich Vellante of Legal Seafoods. I also had to learn about tides and how they worked (Google it!) and read the town’s shellfish laws. No illegal clamming for me! It was a fun learning experience, but the part I love the most is being outside, knowing the beach and ocean better, and being able to bring home treasures for my family that we can actually eat! It’s so cool!